There are several important steps which naturally precede the chemical analysis if the result or data produced is to have any significance. Such steps comprise: (a) Sampling (b) Production of the homogenous mixture for analysis and (c) Drying the collected sample. The sampling incorrectly done will not outcome any meaningful outcome no matter how painstaking or laborious the analysis is. Materials to be analyzed more frequently than not, exist not just in a large size however as well in complex non homogeneous forms. Therefore, attention, commitment and expertise are needed to get a true representative sample. The number or size of the sample is all geared towards preferred result, achievable only whenever the problem of analytical exercise is well stated. Sampling can be illustrated as the operations comprised in procuring a laboratory size which is a true representative of 'a whole lot' for a specific analytical exercise. Sampling is in reality the most difficult step in the whole analytical process; though, it remains the only key to success of the whole analytical program. A) A good sample should encompass the similar features or characteristic with that of the original population from where it is chosen. B) The nature of the sample should be similar with that of the population and should remain so all through the analytical exercise. C) The number of samples must be large adequate to make the outcome reliable. The experience and knowledge of the analyst or sampler. The outcome of survey on the nature, size and configuration of the site of materials to be sampled. The level of sensitivity of the desired outcome. This is significant to note that, there is virtually no single method that can satisfy all the requirements in any sampling case. Modifications and combination of some methods might be essential in a few sampling cases. 1) Random Sampling: This is a process of sampling in which each and every item of the population has equivalent chance of being comprised in the samples. Random sampling can be from either finite samples or infinite samples. 2) Stratified Sampling: This is a method used when population is heterogeneous with respect to the variables (that is, parameters) under study. The population is divided into different homogeneous groups or strata and random sample is drawn from each and every stratum and pooled altogether. The given are different kinds of sample which can be collected. 1) Grab Samples: These are the single samples collected at particular spot at a site over a short time period. These kind samples symbolize a 'snap shot' in both the space and time of the sampling area. Grab Sampling can be (i) discrete grab samples that is, samples taken at chosen location depth and time (ii) Depth- integrated sample that are collected over a predetermined part or to whole depth of an area with respect to time and location. Grab Sample is appropriate either whenever the source is known to vary with time or whenever source composition differs in space. 2) Composite Samples: These kinds of sample give more representative sampling of the heterogeneous matrices in which the composition of the analyte of interest might differ over a time period and or space. The composite samples can be (i) sequential (or time) composites are collected by using continuous and constant equipment (such as pumping machine or via mixing equivalent volume of water collected at a regular time interval, (ii) Flow-Proportional composite samples are collected at a rate proportional to the flow rate. 3) Integrated Samples: Sometimes, information or result desired might be best provided by analyzing the mixture of grab samples collected from various points concurrently or as nearly so as possible by employing discharge-weighted methods like equal width increment (EWI) or equal discloses increment (EDI). Usually sampling can be completed manually or by the help of instrument based on different factors like cost of the analysis, size of the sampling site and the numbers of samples to be acquired. Irrespective of the state of materials to be sampled, the level of heterogeneity, nature and volume of the sample and configuration of the site, the size, the interest of the analyst is to produce gross sample from which the laboratory size sample is acquired for analysis. Ideally, the gross sample is a miniature replica of the bulk of materials to be analyzed. This corresponds to the 'whole lot' both in the chemical composition and in particle size distribution. A certain part of the whole should be eliminated via any of the sampling methods earlier illustrated. The sample might be grabbed or composite based on the judgment of the analyst. The competence and expertise needed for getting the gross sample differ and based on the situation at hand. This range from sampling homogeneous condition of liquid and gases, to sampling particulate solids, to sampling of metal and alloys. 1) The uncertainty which can be tolerated between the compositions of the samples as a whole. 2) The degree of heterogeneity of materials being sampled. 3) The level of particle size at which the heterogeneity starts. This is the final sample on which analysis is taken out from non-homogeneous material. The gross sample might weigh some hundreds of kg or more. A laboratory size which is almost one over thousands or less is obtained. Diminutions in particles size is necessary as the weight of the sample is reduced to make sure that the sample composition carry on to be representative of the original materials. The sample obtained on arrival at the laboratory received further treatment before it is finally analyzed. The integrity of sample to keep chain-of-custody procedure should be ensured. This is a method sampling selection that aims at reducing the samples devoid of making a systematic bias. The method comprises pouring the sample in such a way that it takes on a conical shape, and then flattening it out into a cake. The cake is then divided into quarters and two quarters that face opposite one other are removed, whilst the other two are combined and comprise the reduced sample. The similar process is continued till a reasonable amount of material is obtained. Analyses are made with respect to the sample acquired. The chain of custody method assists in recognizing the source of contamination (if any) and assists the analyst in planning. Samples brought to the lab need further treatment before the analysis commences. This is due to the need to transform the sample from the nature in which it exists at the site of sampling to the form in which it can be analyzed. The treatments as well assist in removing the possible sources of contamination and sample degradation which could lead to the sample destruction. The treatment of samples as well makes sure the homogeneity of samples, in such a way that any small part eliminated for the analysis will be similar to any other fraction. 2) Dissolution: This comprises transforming sample material in a solid form to solution. 3) Grinding and Crushing: This includes decreasing the size of particles of sample materials. It assists increasing the surface area thus allowing effective attack of reagents throughout reaction. 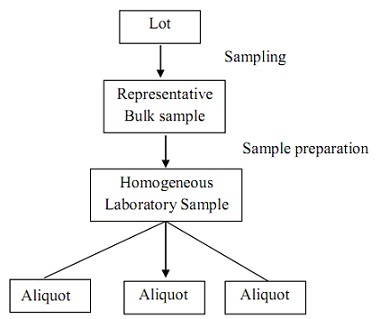 4) Mixing solids laboratory samples: This is necessary that solid materials be systematically mixed in order to make sure arbitrary distribution of the components in the analytical sample. The figure below illustrates sample treatment chart. The utilization of statistics has gone a long way in helping to unravel some of what could be a hard decision to make at the sampling site. These decisions as what must be the sample size or what number of samples to collect could be statistically handled. What must be the size of sample? What number of samples to collect? The sampling contribution to the whole uncertainty can be minimized by analyzing more samples. Rearranging the student's t-test will let us to know the number of sample needed to meet the desired confidence levels. This is converting or transforming the accessible sample matrices to the form which is accessible to instrument. There are different methods used in decomposition. This varies based on the chemical nature of the sample. 1) Strong mineral acids are good solvent for numerous organics. Acids like hydrochloric acid, nitric acid, hydrofluoric acid, perchloric and sulphuric acids are generally employed to this regard. 2) Fusion of Inorganic Materials by acid or basic flux in a molten state is the only way via which a few materials are digested. The sample is mixed by flux in a ratio of around 1 to 10, or 20, sample to flux, the combination is heated in a suitable crucible till the flux becomes molten, the cooled solid is then subsequently dissolved dilute acid or water. 1) Wet Digestion: This is acquired by boiling sample materials with oxidizing mineral acid or mixture of the acids. 2) Dry Ashing: This comprises heating the materials at high temperature (400- 700o C) in a muffle furnace till it is turned to ashes. This is afterward dissolved in mineral acid or water.